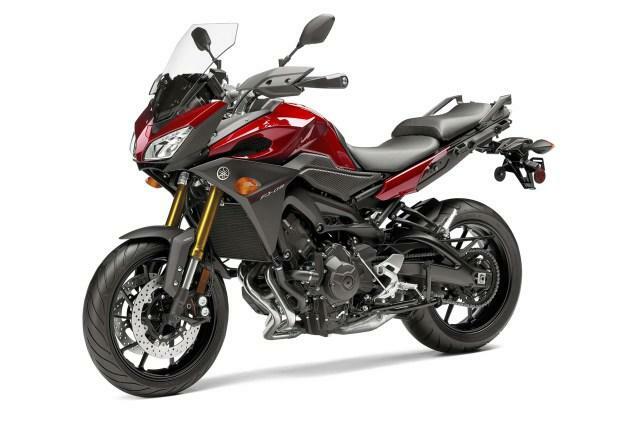 YAMAHA UK has announced prices of the new MT-09 Tracer and YZF-R3. The Tracer, a touring version of the MT-09 naked, costs £8,149 plus on-the-road charges and comes with ABS as standard. The bike has new touring-friendly features including a centre-stand, 12-volt power socket, soft panniers, switchable traction control, adjustable screen, handlebars and an 18-litre tank – four litres bigger than the MT-09's. It gives the MT-09 Tracer a range of over 180 miles according to Yamaha. Like the MT-09 it's got an 847cc three-cylinder engine making 115hp and 64.5lbft. Wet weight is 210kg. The MT-09 Tracer comes in grey, red or blue and will be available from March next year. Meanwhile the YZF-R3's price has been set at £4,799 plus OTR - £200 cheaper than KTM’s RC390 and £400 cheaper than Kawasaki’s Ninja 300 ABS. The R3 will be available from April 2015. Powered by a 321cc parallel-twin, the A2-friendly sports bike makes 42hp and 21.8lbft. ABS is standard and it's 5kg lighter than the ABS-equipped Ninja 300. Braking is provided by a single 298mm floating front disc and 220mm rear. It comes in 'Race Blu' or black. Prices have also been announced for Yamaha's new R1 and R1M.